Join us this week as we welcome the rock band, The Last Year. Hailing from Baltimore, MD., The Last Year is an alternative rock band. 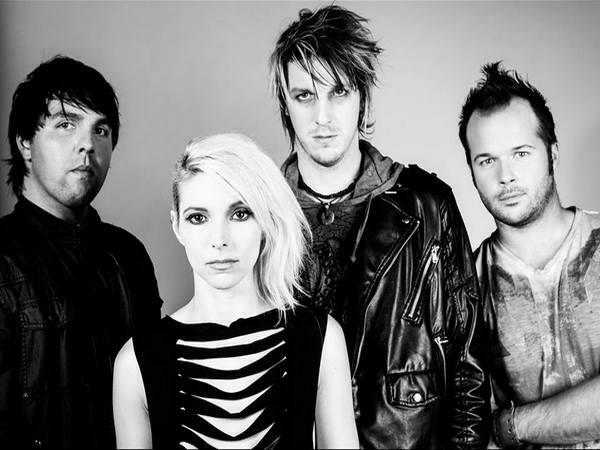 The act stems from an idea of front-girl Niki Barr, on vocals, and Scott Ensign, playing bass and synth. The pair, complemented by drummer, BJ Kerwin, and guitarist, Scott Griffith, approach their music with a kaleidoscopic attitude, embracing diverse influences and refusing to give in to conventions. The Last Year recently teamed up with Shanachie Entertainment in order to release a self titled EP of new material. Currently their single "Sugar" is at Alternative radio and their video is in all Six Flags America Theme parks throughout the country. Working with The AFE and USO on many tours, Niki Barr has visited thirty three countries on four continents in support of our deployed troops. In addition she has dedicated visits to Ranstein and Walter Reed. We will talk to them about their upcoming schedule, get a behind the scenes look at their music, feature their latest songs, and ask them to share their message for the troops. Please be sure to visit The Last Year at http://thelastyear.net/ and spread the word. Fans are welcome to call in and speak live with with them during the show (718) 766-4193 If you would like to participate in the live chat during the show, you must sign up on the show site first and then log in during the show. More great music for a really great cause! And as always we will give shout outs to our deployed military listeners. This is sure to be a terrific show so be sure to join us, Sunday May 4th 2014 at 4:00 PM EDT! Our message to the troops....WE do what we do, because YOU do what you do.